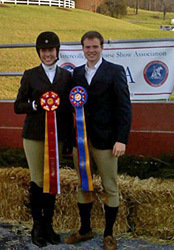 Drew Nichols ’11 and Kelly Gerland ’12have qualified to compete in the IHSA National Finals horse show May 4-6 at the Kentucky Horse Park in Lexington, Ky.
Each had stellar performances April 11 at the Zone 4 Championship, hosted at the Bridgewater College Equestrian Center. Nichols (Frederick, Md./Governor Thomas Johnson), a senior, was the champion in walk-trot to earn a trip to Kentucky. Gerland (Ivern, Pa./Great Valley), a junior, was the reserve champion (2nd place) in the intermediate flat. Kristine Guthrie ’13 (Glenmore, Pa./Downington West) finished third place intermediate fences and Kelli Greenslade ’13 (Bowie, Md.) was fourth in walk-trot-canter.